This beautiful new ride is the dream trail designed by Bogdan, organiser of our trails in the Rhodope Mountains. The Thracian Valley is an ideal location for riding with smooth, picturesque terrain of rose and lavender fields which allow for a faster pace. The trail combines plenty of canters and amazing scenery with ancient Thracian and Roman ruins, delicious wines and spa opportunities thanks to the healing mineral springs. Accommodations are comfortable throughout and you will often have access to a swimming pool, sauna or spa at your hotels. Throughout this ride you will explore many of the region's wonders such as visiting the biggest mound-temple in the Balkan peninsula, dating back to the VI-IV century BC. The itinerary includes visits to the fascinating towns of Plovdiv, Hissar and Koprivshtitsa, riding in the Sredna Gora mountains and a look at the Thracian Cult Complex which dates back to the 4th century BC. A wine-tasting is also included - the Thracian Lowlands are one of the most highly recommended wine regions. Accommodation during the trail is comfortable in small hotels often with pool and spa. Single rooms are available. Most nights the rooms are en-suite. A few of the accommodations have a WiFi connection. On some of the hotels there are pool or sauna. All meals are included during the trail and you can expect hearty local fare and the chance to try several traditional dishes. Meat and cheese are prevalent and bread is served with every meal, but vegetarians and other dietary requirements can be catered for with prior notice. Dinners are three courses and always start with the traditional salad of cucumber, tomatoes, onions, cheese and sometimes olives. Lunches are generally a picnic eaten from your saddlebag, including a sandwich, fruit, biscuit/cereal bar and water. A few times during the week you will eat at a bar in a small village. Beer and wine are commonly available and delicious. A beer cost around 2 EUR and a glass of wine around 3-5 EUR. Coffee, tea and juice are served with your breakfasts. The horses here are forward-going, responsive and brave. A range including Trakehner, Shagya Arabian and Eastern Bulgarian breeds, between 155-165 cm at the withers. English style tack, primarily Wintec saddles and horses in snaffle bridles. Your luggage goes with the support vehicle. A trail through the Thracian Valley combining excellent riding with historical and cultural sightseeing, beautiful views, quality wines, fresh produce and spa opportunities. The terrain on this trail is easy-going so there are plenty of chances to canter as you explore the region. Day 1: (Saturda) - Arrival and transfer from Sofia airport (approximately 2 hours) to the village of Belashtitsa. 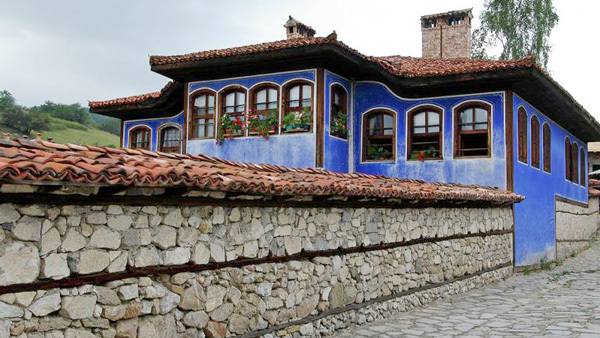 The village is only around 6km from Plovdiv which is considered to be the cultural capital of Bulgaria and is more than 8000 years old. It features the remains of a civilisation older than Rome itself and is a contemporary of ancient Troy. You will take a tour of the old town of Plovdiv, including a visit to the Ethnographic Museum and the antique theatre, one of the best-preserved in the world. Accommodation tonight is at a spa hotel with swimming pool. After breakfast you will be transferred to Tsaratsovo village (approximately 30 minutes) from where you will start your journey. The horses will have been transported here already from their home in the Rhodopes. The starting point of the trail is actually one of the biggest and most famous horse sport facilities in Bulgaria. Once you are matched with a suitable horse you will begin your ride towards Hisarya, the most famous spa centre in the country with 22 healing mineral springs. Aside from being a famous health resort, Hisarya is also notable for its history as it is full of archaeological findings dating back to Thracian times and even the Roman Empire. You can walk between Roman baths, aqueducts, bastions and fortified walls. Today's ride is around five and a half hours with smooth fields allowing for good canters. Lunch will be a BBQ picnic beside a river. Overnight tonight is at a spa hotel with mineral water pool, a sauna, massage centre and jacuzzi. Today's terrain is a combination of flat and hilly and the trail passes by fields and vineyards, meadows and oak forests. You make your way towards a wine cellar to enjoy a wine-tasting and some superb cuisine, as well as having the chance to indulge yourself in some spa treatments. Along the way you will visit the a spectacular Thracian complex with a temple mausoleum, the largest of its kind in south-east Europe. Situated in Starosel, this was only recently found and is still being excavated but allows you to learn more about the mysterious Thracian people, their amazing cultural heritage and their historic significance. Today's ride time is around four hours and lunch is a picnic from the saddlebags, eaten beside beautiful meadows. Dinner and overnight is in Starosel at a winery and spa hotel. 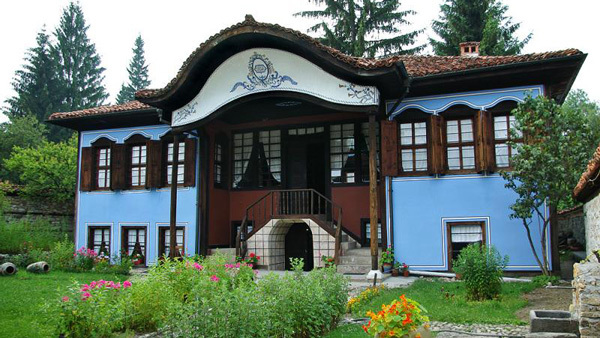 Today's five hour ride takes you to the historic town of Koprivshtitsa which dates back to the Renaissance period. It is located in a picturesque valley alongside the Topolnitsa River, in the heart of Sashtinska Sredna Gora. You will eat lunch in a restaurant on your way to the village. On arrival to Koprivshtitsa the authentic atmosphere of its cobblestone streets will take you back in time and you'll have a guided tour. Tonight you'll sleep in a park hotel about 3km outside of the village. After breakfast you will ride along the ridge of the mountain with magnificent views of the famed 'Valley of the Roses'. At the foot of the mountain there is the resort of Strelcha waiting for you - your spa hotel again offers massages and mineral water treatments. Riding time today is approximately five and a half hours and lunch is eaten at a restaurant. Overnight at a spa hotel. Today you will ride for around five hours, visiting the Thracian ritual temples around the city which date from between 4th - 6th centuries BC. Lunch will be on the shores of Lake Belovitsa before continuing your ride in the afternoon. Tonight's hotel has a large spa and swimming pool so you can have a well-deserved rest. On this last day of riding you will cover the smooth terrain of vineyards and rose fields on your way back to the riding centre. Your route includes crossing a beautiful river and passing by a rose oil factory - you will experience the scent of the famous Bulgarian rose for the last time on this trip. Lunch today is from your saddlebags. The ride today lasts around four and a half hours. Tonight you will sleep in a 4* spa hotel with pool. After breakfast there will be a transfer to Sofia for your trip home. The journey takes around 90 minutes (120km) by minibus. NB. The itinerary may be modified for reasons of safety, weather or unforeseen circumstances. Not included: Flights, alcoholic drinks. Travel: Fly into Sofia or Plovdiv. Transfer: Book in advance with HorseXplore. From: Sofia och Plovdiv airport to equestrian center. Price: Included at set times. Time: You should ideally arrive into Sofia no later than 14:00, in order to allow time for sightseeing in Plovdiv. On departure day your flight should not leave Sofia before 12:00. If you are coming into Plovdiv instead then please contact us for timings. Single room: It is possible to book a single room (price for single supplement available under Dates & Prices). If there is no one to share a room with, a single supplement will be added. Credit card: The riding centre do not accept credit cards. In some places it is possible to pay by credit card but it is best to change to BGN at the airport. Tipping: Not required but appreciated. Wifi: Yes in some accomodations. Group size: Minimum 2 riders, maximum 8. Age limit: Going on trails kids must be minimum 11 year old, accompanied by an adult.